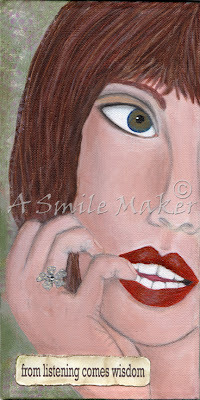 I would like to show you another piece I completed in my "simple truth/simple reminders" series. It is titled "From Listening Comes Wisdom". Listening, really listening, is probably one of my most difficult challenges. And you know what, I am not alone. (that's why God gave us two ears and only one mouth!) I always thought of myself as a good listener until I became more aware. There is more to listening than just hearing words. It's the feelings behind the words you hear that develops true listening. I love this painting and I also love what you had to say about listening. I am learning to be a better listener, which I am very thankful for. You are so right that it is so much more than just hearing words. so true! I often find myself thinking of the next thing I'm going to say instead of listening or I get reminded of something during listening that makes me think of something else and I start "thinking of that" while I appear to be listening. It's so hard to really give attention and "hear" what is being said. I will need this art for my wall! I like your watermarked name over your art too! And the fact that you are grouping "series"- that's a great idea. Keep it up! Such an inspirational post, Teresa. It gave me a lot of food for thought. It gave me the push I needed to try harder to be a good listener, which I know I'm not...And the artwork is amazing, like I said before, I love the way you did her teeth, as well as her hands, really beautiful! Thank you for this reminder about listening involving more than just hearing words. Love the painting, too! Thanks, Jennifer - I love all of your poetic comments!